A historic training on how to produce chocolate from locally grown cocoa beans is currently underway in Honiara. It was organised by the Adventist Disaster Relief Agency (ADRA) with support from Department of Foreign Affairs and Trade of the Australian Government (DFAT) and Solomon Islands NGO Partnership Agreement (SINPA). About 40 farmers mostly young farmers with few elderly ones from East Guadalcanal and Malaita Province are part of the training under an ADRA project called Youth Empowerment Livelihood Project (YELP). This one and half week training is being conducted by two chocolate consultants based in Hawaii, United States namely; Dr Nat Bletter, ethnobotanist, cacao researcher, and chocolate maker, and co-founder David Elliott, a chocolate maker and avid traveller. They are business partners operating Madre Chocolate based in Hawaii for the past 5 years. The training which kicked off last Wednesday saw the local participants undergoing both theory and practical sessions. During the practical segments, the participants were taught on how to identify the best cocoa pods, separating them accordingly for processing, learn some of the drying techniques, how to ferment, tempering and getting the mixture right. The participants were able to compare chocolates from different manufacturers to know which is of high and low quality. There were farm visits to East Guadalcanal as part of the training to see some of the cocoa plants and the process used to dry the beans. At the training venue a cocoa drier made of plastic was also constructed to allow the farmers to better understand a simple drier. David Cram International Program Manager ADRA International said, the training is like pilot project after the chocolate training was recommended. He said, following the training local farmers can have a better understanding of the process involved in chocolate production. He said, similar training will be conducted in Vanuatu next year. At the opening ceremony ADRA Vanuatu Project Manager was also present. One of the facilitators Dr Nat in an interview with the Solomon Star said it’s their first time to be in the country conducting such training. He said the training was made possible after a friend based in Vanuatu recommended them to the organisers of the training. And its an eye opener for the local cocoa growers and farmers. Since last week, participants were able to learn about how to plan a plantation, planting of cocoa, how to grade and identify the best cocoa pods, how to construct a drier, drying technics and how to avoid smoked cocoa, fermentation, tempering and the process involved in the final production of a chocolate, he said. Dr Nat said, throughout the training the participants are so keen to learn about how to produce chocolate bar, hot chocolate and chocolate banana. At the training the farmers were able to produce a pure chocolate which has 70% cocoa and 30% sugar. Few locals who have tasted the chocolate said, it was of premium quality which means it be produced here. Dr Nat said, most of the cocoa farmers have expressed excitement how possible it would be for them now to produce their own chocolate rather than buying it from the shops. He pointed out, the training is important so that cocoa farmers can know the process involved in chocolate production, taste the different varieties of chocolate and mostly importantly for cocoa farmers to better understand what chocolate manufacturers are expecting from cocoa farmers and their beans. 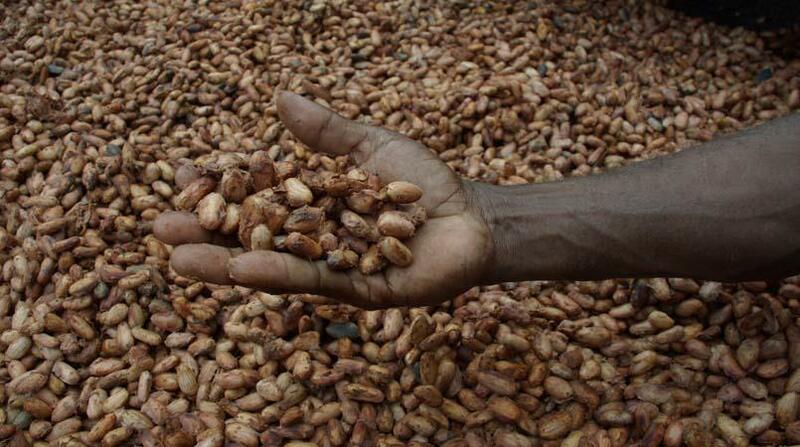 He said, most times cocoa farmers produce cocoa beans without tasting the end product. During the training a professional grinding machine was used to grind up the dried beans before heating. He said such grinding machine costs around SBD$3000.00 (US$376) and any one can produce their own chocolate. Dr Nat believes with the knowledge and skills gained from the training these cocoa growers can do something with the cocoa beans by generating an income from chocolate production.